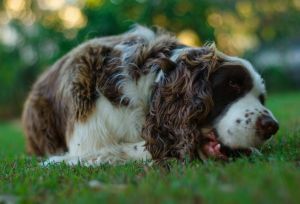 Like other Hunting Dog Breeds, the English Springer Spaniel is bred for flushing and retrieving game. They do make a good family dog and are quite popular. It has been said that there are two types of English Springers though: the ones used in the field; and the ones used for showing. Springers used in the field usually have shorter coarser coats and are selected for their abilities in the field including overall strength and stamina, and their adaptability in the tough terrain. The show dogs tend to be lighter (not as sturdy) and have longer hair. They are generally black and white, or liver and white. They stand 17-20 inches (43-51cm) and weigh 35-55 pounds. Their coats can be short and course or longer – depending on their breeding. These are friendly and relaxed dogs. They are alert and a great companion for hunting or in the home. They are great family pets that need a lot of exercise to satisfy its stamina. Being turned out in the yard is not enough as they need mental stimulation. If you adopt a Springer Spaniel You will be greatly rewarded if you invest a bit of time in socialization & training. They will be suitable for almost any home if the owner is committed to regular exercise and training. They are prone to Hip Dysplasia or Retinal Atrophy. Both of these issues seem common among Hunting Dog Breeds. It may be a good idea to learn about cleaning your spaniels ears as some can suffer regulare ear infections if they are not kept clean. Regular veterinary care can help with these issues. If you want one of these wonderful dogs you should try an English Springer Spaniel Rescue so you can save a life. Of course breeders are an option too. And last but not lease, check an animal shelter. Too many purebred dogs end up in animal shelters.